Phytoplankton is a microscopic organism that lives in fresh and salt water environments. Most phytoplankton are single-celled plants and like land plants, phytoplankton have chlorophyll to capture sunlight. Carbon dioxide is consumed and oxygen is released. All phytoplankton photosynthesize, but some get additional energy by consuming other organisms. 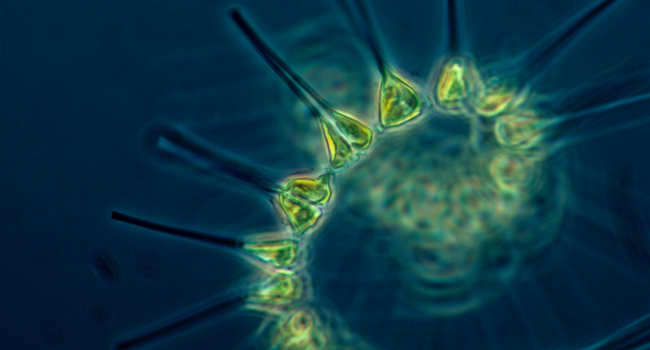 Phytoplankton growth depends on the availability of carbon dioxide and sunlight. Like land plants nutrients are required for phytoplankton growth and some of those nutrients include: nitrate, phosphate, silicate, and calcium. They also require trace amounts of iron which limits phytoplankton growth in large areas of the ocean because iron concentrations are very low. Several other factors influence the growth rate of phytoplankton including water, water depth, temperature, salinity, wind, and what kinds of predators are grazing on them. For three billion years marine phytoplankton has supported virtually all living creatures in the worlds’ oceans. Phytoplankton is the foundation of aquatic food. From microscopic, animal-like zooplankton, fish, and whales all feed on phytoplankton. As much as phytoplankton is a great thing, there are some species that produce biotoxins and these are responsible for the harmful algal blooms and “red tides”. So just like edible wild land plants there are some species that are fabulous for your health and some that can take your life. Edible wild food that comes from the water comes with a huge list of health benefits for us. It is packed with omega fatty acids, chlorophyll, zeaxanthin, beta carotene, protein, dietary fibre, antioxidants, and vitamins A, C, D and K. It also contains calcium, magnesium, selenium, and iron. 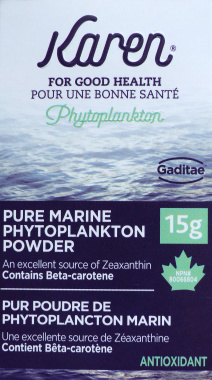 There is a specific brand of phytoplankton that has been approved by Health Canada called Karen Phytoplankton. The company behind Karen Phytoplankton is New Brunswick-based Blugenics Innovations which launched in November 2015. In one year, sales soared to almost $2 million. Company founder, David Hunter credits this rapid growth due to many health benefits this phytoplankton is responsible for. Company-led studies have shown that this marine food is effective in treating many ailments including: digestive issues, inflammation, fibromyalgia, chronic pain, migraines, low energy and skin issues such as psoriasis and eczema. Blugenics has a partnership with the New Brunswick Innovation Foundation to start a double-blind placebo-controlled clinical trial on effects of people with irritable bowel syndrome after they consume Karen Phytoplankton. “Karen is a single ingredient superfood phenomenon similar to Quinoa, where you have this ancient product that is suddenly seeing a surge in Western society,” said Dr. Melanie Wills, a University of Guelph PhD student in molecular and cellular biology who is part of a research team setting up a trial to investigate the product’s effectiveness in treating irritable bowel syndrome (IBS) and other digestive problems. David Hunter is now on a mission to bring the health benefits of phytoplankton to everyone. Today, Karen Phytoplankton is cultivated in a state-of-the-art facility that is certified according to strict global food safety protocols HACCP and ISO 22,000, meaning the product is non-toxic and entirely safe for consumption. Like sea veggies, phytoplankton isn’t that great tasting so adding Karen Phytoplankton powder to smoothies, applesauce, yogurt, or anything else you want to is the simplest way your body can enjoy all the nutrients it offers your body. Edible wild food from the land and the water is one way to ensure you’re boosting your immune system and doing everything you can to live a long, energetic and healthy life. Visit the Karen Project and and be sure to use the code KAREN4FRIENDS to get a 10 % discount off your cart total. Coupon expires December 31, 2017 and cannot be used in conjunction with other coupons or specials. Unlimited usage per coupon, per person (in separate orders). So happy to hear of this product being produced in our beautiful Canada!!!! Phytoplankton would not solve hunger – malnutrition yes. I don’t know if it can be grown in that manner as I have very little knowledge on this. Global hunger could be easily alleviated if wild food such as Japanese knotweed, kudzu and other rapid growing plants were introduced into poor nations. Want to know how to eat the powder in food . can you mix it in food you eat? Whats thr best way to take this? You can mix it into your smoothies, sprinkle on salads, or mix with water and drink it!